Announcement of a Joint Call on “Novel technologies, solutions and systems to reduce the greenhouse gas emissions in animal production systems”. The Joint Call is a partnership between three European ERA-NET research initiatives on Sustainable Animal Production (SusAn), Monitoring and Mitigation of Greenhouse Gases from Agriculture and Silviculture (ERA-GAS) and Information and Communication Technologies and Robotics for Sustainable Agriculture (ICT-AGRI). The Joint Call is supported by research partners from 24 countries, including from outside of Europe, participating countries are: Belgium, Chile, Denmark, Estonia, Finland, France, Germany, Greece, Ireland, Italy, Latvia, Lithuania, The Netherlands, New Zealand, Norway, Poland, Romania, Slovakia, Spain, Sweden, Turkey, UK and Uruguay. The call announcement and link to the online submission tool can be found on the FACCE-JPI website. In a recent study, the yearly nutritional and greenhouse gas (GHG) emissions impacts of eliminating animals from United States agriculture were quantified. Modelling estimated that agricultural GHG emissions would decrease by 28%, but that the resulting nutritional profile of a plant-based diet would be inadequate for US citizens. New research by the New Zealand Agricultural Greenhouse Gas Research Centre (NZAGRC)’s Dr Andy Reisinger and Dr Harry Clark shows that the livestock contribution to global warming is significantly greater than previous estimates. Dr Reisinger says the study also addresses how much livestock will contribute to future warming under different scenarios and how reductions in livestock emissions would impact on allowable CO2 emissions as set out in the 2016 Paris Agreement. 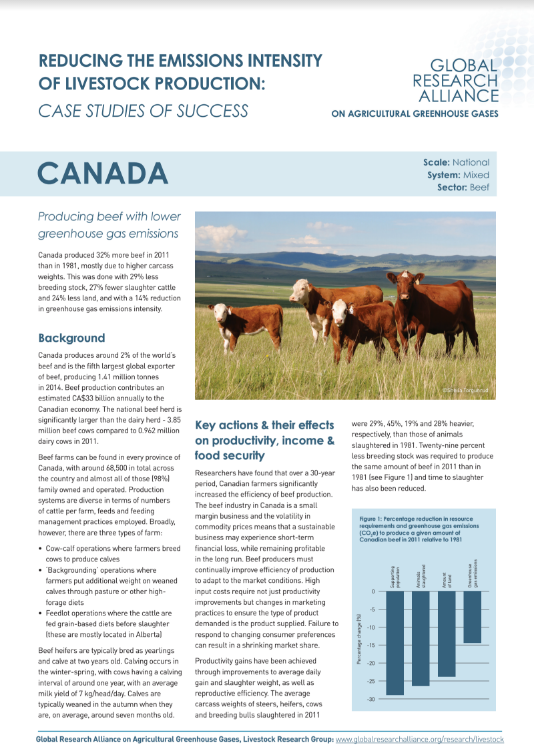 The Global Research Alliance’s Livestock Research Group has published a new case study on beef production in Canada. The study discovered that Canada produced 32% more beef in 2011 than in 1981, mostly due to higher carcass weights. This was done with 29% less breeding stock, 27% fewer slaughter cattle and 24% less land, and with a 14% reduction in greenhouse gas emissions intensity. The Livestock Research Group is documenting countries’ successes in reducing on-farm emissions intensity and increasing productivity and resource use efficiency (or reducing other externalities) of livestock systems. The case studies showcase the diversity of approaches being employed across different livestock systems and scales (local, state and national). 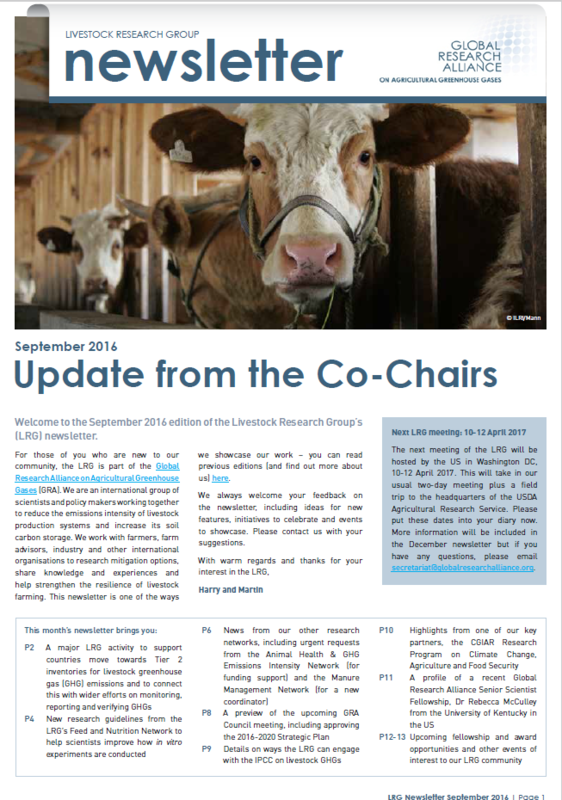 The latest version of the GRA’s Livestock Research Group newsletter is now available.